Oversize 320mm Brake kit includes 320mm fixed wave rotor. 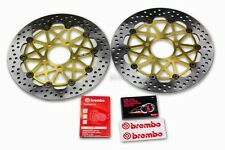 Brembo 320mm HPK Supersport Front Brake Discs Pair Yamaha YZF1000 R1 / R1M 15> Good condition. Came with a spare set of wheels and are no longer needed. 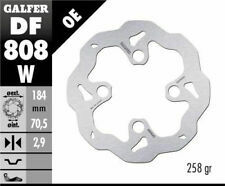 New goldfren front brake disc made in the eu not china nsr125 f r 1993 1998 new cnc machined. For Sale, Suzuki World Superbike rear brake disc, fully floating. Bought in 2002 from the importers race team. It has had light used on a race bike. Moto3 Moto2 Rear Disc Brake 189mm O.D Two Included . Condition is Used. Thought to be Brembo but not sure. EBC floating front brake discs (pair) taken off my Yamaha R6 2004 race bike. Only been used for 1 season of racing, when I bought them they had had very little use. The discs are in good condition, no warping or pitting, with 5mm thickness the discs have loads of life left in them. FOR CBR125. NEW FRONT BRAKE DISC. GENUINE HONDA PART. FOR HONDA CBF125. NEW FRONT BRAKE DISC. GENUINE HONDA PART. Yamaha R1.R6 Wavy Wavey front Discs"Track Tested"
Front Wavey discs 1 Pair. YZF R1 98-03. These Discs are Made from SUS420 High Carbon Stainless Steel and the Carrier is CNC Machined (Not stamped and pressed) from High Quality 6061-T6 Aluminium Alloy. Yamaha R1 2007-2014 Rear Wave Disc Part # YA34RID. ZONTES TIGER ZT125-3A 2009 TO 2015. Armstrong Front Wavy Brake Disc. Laser cut from premium Japanese induction hardened stainless steel, they are then diamond ground for a perfect finish. SUZUKI GSXR 1000 2003-2004. A&R Racing. 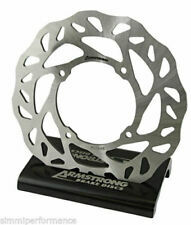 ARMSTRONG REAR BRAKE DISC: 250mm. Kawasaki Z750 L / ABS 07-11. Kawasaki Z1000 07-11. Kawasaki ZZR1400 / ABS 06-11. Kawasaki GTR1400 / ABS 08-11. Fuel Tap Kits. Chances are that through our international network of high quality suppliers we will be able to source the item you are looking for. 6 bolt fixing at 150mm centres. FRONT BRAKE DISC. SINGLE DISC MODELS. WE TAKE NO RESPONSIBILITY FOR ANY ITEM THAT DOESN'T FIT CORRECTLY WITH YOUR BIKE. Made in Japan. URGENTLY REQUIRED. ER-5 (ER500)A1-A4, C1-C5P1997-2007. REAR BRAKE DISC & PADS. GOOD QUALITY. Akrapovic Clothing. Harley Davidson. K&N Oil Filters. Moto Guzzi. Universal Air Filters. Cleaning Products. K&N Motorcycle Filters. Rapid Bike Fuelling Modules. Kawasaki ZX10R 2004-2010. Kawasaki ZX6R 1998-2011. Patented AXIS Design - featuring Direct-Link™ load transfer system.reduces carrier to disc shear force wear to provide longer rotor life. Greater rotor to carrier thermal transfer capability for the most effective floating cooling and fade resistance. GSX1300 Hayabusa 2008-2014 (2nd. generation). REAR BRAKE DISC & PADS. (Mon – Fri, 10am – 5pm). URGENTLY REQUIRED. REAR BRAKE DISC. URGENTLY REQUIRED. MADE IN JAPAN. Armstrong Rear Wavy Brake Disc. Laser cut from premium Japanese induction hardened stainless steel, they are then diamond ground for a perfect finish. SUZUKI GSX 600 F 1998-2004. We are suppliers of parts and accessories for all types of motorycles. I Bought this performance oversize disc kit from MGF MANIA 4 months ago for £225 ,I never got around to fitting it. The kit is the 280mm. Drilled and grooved type together with high quality anti fade Pads. Our Referance - BKF714. (All discs are sold individually). All discs are Wavy Front Floating except those indicated otherwise. 1 x Front Armstrong Wavy Disc. Thickness of disc mm : 5. Disc Colour : Stainless Steel. Motoden Limited - Please call any of our locations to arrange a test drive. - Call us on 442039123780 or click here to find out more. FOR NT650 DEAUVILLE. NEW FRONT R/H BRAKE DISC. GENUINE HONDA PART. Service: 0208 390 4621. 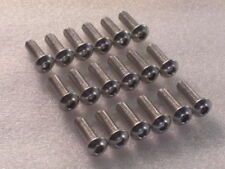 Spares: 0208 399 7449. Sales: 0208 399 2417. Kawasaki Versys 650 2006 onwards. Kawasaki Z750 2004-2006. All Galfer Wave Discs are stress tested using the COSMOS analysing system. Kawasaki ZX 10R 2004-2010. Kawasaki ER-6F 2005 onwards. Kawasaki ER-6N 2005 onwards. ARMSTRONG REAR BRAKE DISC: 230mm. ARMSTRONG REAR BRAKE DISC: 250mm. Fuel Tap Kits. Chances are that through our international network of high quality suppliers we will be able to source the item you are looking for. 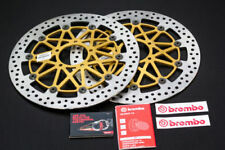 Brembo 330mm Conversion Front Brake Disc. Developed from Racing, the Brembo Serie ORO upgrade disc uses a 330mm, 5mm thick high carbon stainless rotor fixed to a CNC machined hard anodised alloy centre with floating bobbins. Armstrong Front Wavy Brake Disc. Laser cut from premium Japanese induction hardened stainless steel, they are then diamond ground for a perfect finish. KAWASAKI ZR-7 / S 1999-2004. A&R Racing. Armstrong Wavy Disc. 1 x Front Armstrong Wavy Disc. Armstrong provide exceptional quality. Finding the correct FRONT or REAR Wavy Disc. Disc Colour : Black. Fits Front left or Right Side. Number of holes for Bolts : 6. Armstrong Front Wavy Brake Disc. Laser cut from premium Japanese induction hardened stainless steel, they are then diamond ground for a perfect finish. HONDA CBR 1000 RR FIREBLADE 2006-2007. We are suppliers of parts and accessories for all types of motorycles. ARMSTRONG REAR BRAKE DISC: 220 mm. Suzuki GSXR600 97-11. Fuel Tap Kits. Chances are that through our international network of high quality suppliers we will be able to source the item you are looking for. EBC Floating Disc Conversion. EBC Floating disc features We will not pass on any of your personal details to third parties. We will always inform you about the status of your order as it changes. Pro-Lite discs resist distortion longer PLUS the unique “Birdswing” drill pattern prevents ridges developing on the rotor. 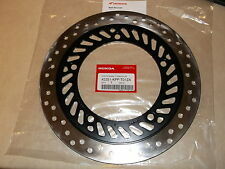 GENUINE HONDA NT700 DEAUVILLE REAR BRAKE DISC NEW FITS ABS AND NON ABS MODELS. FOR NT700. FITS ABS AND NON ABS MODELS. NEW REAR BRAKE DISC. GENUINE HONDA PART. Tippetts Motors (Surbiton) Ltd.
5 out of 5 stars - GENUINE HONDA NT700 DEAUVILLE REAR BRAKE DISC NEW FITS ABS AND NON ABS MODELS. 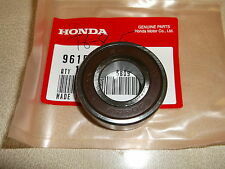 15 product ratings15 product ratings - GENUINE HONDA NT700 DEAUVILLE REAR BRAKE DISC NEW FITS ABS AND NON ABS MODELS. Armstrong Front Wavy Brake Disc. Laser cut from premium Japanese induction hardened stainless steel, they are then diamond ground for a perfect finish. SUZUKI GS 500 EK-K3 1989-2003. SUZUKI GS 500 / F 2004-2008. Armstrong Front Wavy Brake Disc. Laser cut from premium Japanese induction hardened stainless steel, they are then diamond ground for a perfect finish. YAMAHA YZF R1 2007-2008. A&R Racing. Armstrong Front Wavy Brake Disc. Laser cut from premium Japanese induction hardened stainless steel, they are then diamond ground for a perfect finish. YAMAHA YZF R1 1998-2003. A&R Racing. SUZUKI GSF 1200 / S BANDIT 1996-2005. Armstrong Front Wavy Brake Disc. Laser cut from premium Japanese induction hardened stainless steel, they are then diamond ground for a perfect finish. A&R Racing. Armstrong Front Wavy Brake Disc. Laser cut from premium Japanese induction hardened stainless steel, they are then diamond ground for a perfect finish. HONDA CBR 600 RR 2003-2011. We are suppliers of parts and accessories for all types of motorycles. Armstrong Front Wavy Brake Disc. Laser cut from premium Japanese induction hardened stainless steel, they are then diamond ground for a perfect finish. SUZUKI GSXR 600 K4-K5 2004-2005. A&R Racing. Armstrong Front Wavy Brake Disc. Laser cut from premium Japanese induction hardened stainless steel, they are then diamond ground for a perfect finish. SUZUKI GSXR 1000 2005-2008. A&R Racing. Armstrong Front Wavy Brake Disc. Laser cut from premium Japanese induction hardened stainless steel, they are then diamond ground for a perfect finish. YAMAHA YZF R6 1999-2002. A&R Racing. KAWASAKI ZX10R 2008-2013. Armstrong Front Wavy Brake Disc. Laser cut from premium Japanese induction hardened stainless steel, they are then diamond ground for a perfect finish. A&R Racing. Armstrong Front Wavy Brake Disc. Laser cut from premium Japanese induction hardened stainless steel, they are then diamond ground for a perfect finish. KAWASAKI ZX6R G/J 1998-2001. A&R Racing.